According to the BBC, David Cameron has moved to resolve a Cabinet row over the UK’s climate change targets, with an agreement on emissions to be announced on Tuesday. This will see drastic cuts in greenhouse gas emissions to 2027 and an overhaul of the way energy is produced. But ministers worried about the impact on the economy and burdens on industry have secured a get-out clause. The targets will be reviewed if European nations backslide on their own climate commitments. Labour have previously said that if ministers did not accept the committee’s recommendations in full it would amount to a “green betrayal” and accused Mr Huhne of failing to “show leadership” over the issue. They say carbon reduction targets must not be watered down as part of efforts to alleviate red tape on industry. Greenpeace described the agreement as “rare victory for the green growth agenda” in the face of what it said was “vehement” opposition from the Treasury and the Department of Business. 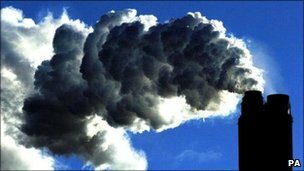 But Friends of the Earth said Mr Huhne should have gone further and accepted advice to tighten the UK’s existing 34% emissions reduction target, by 2020, to compensate for the cuts already achieved due to the recession.